The Tarot deck is one of the most intuitive tools to utilize when you need answers about your life and events to come. It has been used for thousands of years, harnessing the divine connection we all have with Source, to unveil messages from our Higher Self. By intentionally requesting guidance, the answers are revealed in the cards are dealt – this is not a coincidence. The Hierophant card sends a message heavy in tradition and institution. The Hierophant card is the Number 5 card in the Major Arcana of the Tarot deck. The Major Arcana is composed of the first 22 cards of the Tarot deck. These are the trump cards, numbered 0 to 21. The illustration of The Hierophant card, ruled by Taurus, portrays its intricate meaning. This figure is also known the High Priest, Chiron, the Shaman or the Pope, and is considered to be the counterpart to The High Priestess. It displays a religious figure of authority sitting upon a throne of some kind in a religious setting. He has his right hand raised, holds a triple scepter in the left, and has two crossed keys and two initiates at his feet. You can find the right hand being raised symbolically in benediction in nearly all ancient belief systems and religions – even The Magician of the Tarot deck has this same hand raised. But, while The Magician harnesses the raw power of the spiritual realm to manifest here in the physical realm, The Hierophant harnesses the Universe’s power and disperses it to humanity in the form of religion and spiritual practice. The scepter is symbolic of the control he maintains over the three realms – mental, physical and spiritual or mind, body and spirit. He possesses perfect balance of the subconscious and conscious minds, and is a spiritual teacher trusted to give the guidance that he receives from being intensely connected to Source. The two crossed keys represent a dualistic balance necessary to unlock truth – between the conscious and the subconscious, the spiritual and the physical. The two initiates that kneel before him reflect his purpose of blessing them with religion and spirituality, so they can then fulfill their own life purpose. The Hierophant Card represents the gateway to a higher spiritual consciousness, practiced through ritual and learned by trusted word and example. While The Magician points us in the right direction, The Hierophant takes us by the hand and leads us to spiritual growth. He is a tool so to speak, to be used as a guide that can connect us with the sacred divine. When The Hierophant card appears in a Tarot reading, it indicates a need to honor tradition, (or possibly create some new traditions of your own). He represents a reliable path to achieve growth in the physical and spiritual realms – both of which are obtained easily if there is a willingness to act in a traditional way. 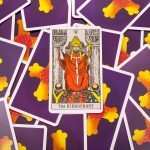 Depending on where the card falls or the question that is asked, The Hierophant card can be self-reflective, or reflective of another person in your life. In either case, the Hierophant card holds an energy that is conventional and established- it is not innovative, pioneering, or free spirited in any way. You may need to consider slowing down the dynamic and rebellious energy within you lately, because there is a current need to respect tradition. This can revolve around a belief system, religious practice, or any other type of “institution.” Some examples include work, social groups, or other programs and/or communities you are involved in. The intuition you receive immediately from the card will shed light on your situation. The Hierophant is himself sharing wisdom in an institutional setting, which symbolizes the never-ending pursuit of knowledge. Therefore this card can also indicate a time of learning or increased studies in a formal manner. Of course, all concepts that fall under sacred and righteous are also included in this card. This includes marriage, partnerships, alliances, moral values, and conscience. This relays a message of not stepping out of the box, taking an orthodox approach, resisting the urge to fight the status quo, and adapting to what is already in place.